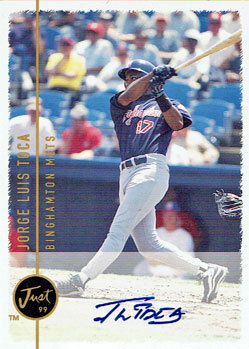 I wasn’t paying that much attention to Major League Baseball or the Mets in 1999, so I don’t remember how much prospect hype Jorge Luis Toca was getting in his first year of U.S. professional baseball. Looking at Toca’s minor league numbers, I imagine that at the very least Binghamton Mets fans were very happy to have him on their team. In 75 games, Toca hit 20 home runs and posted a .308 batting average, .384 on base percentage and .584 slugging percentage. At the Triple-A level in Norfolk, Toca improved his batting average to .335 but saw his power numbers dip – just five home runs in 49 games, with a .500 slugging percentage. I wouldn’t have been in any rush to run John Olerud out of town to open up a spot at first base, but I know I would have been interested in finding out what Toca could do at the major league level, particularly with 40-year-old Rickey Henderson serving as the Mets’ primary left fielder. As it turns out, Toca didn’t accomplish a whole lot with the Mets. His major league career consisted of 27 at-bats in 25 games, almost all of which were part of three separate September call-ups. He never came close to matching his 1999 minor league success again, either. Toca continued to play in affiliated baseball through 2006, though beginning in 2004 he started spending some time playing in the Mexican League, too. His final season was 2007, when Toca played in 12 games for the Acereros de Monclova. 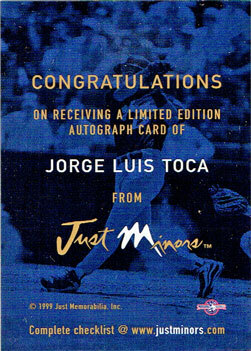 If not for companies like Just Minors, Fleer and Upper Deck, Toca might present a challenge for collectors seeking his autograph. His certified autographs are relatively plentiful and inexpensive, though — I got this one as part of a five cards for $10 deal at a hobby shop in Pennslyvania earlier this month. Next Post Are the Mets making the right call to pass on Maddon?